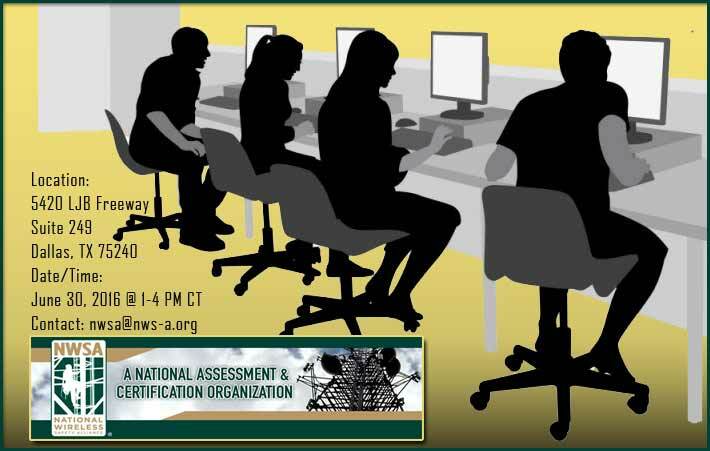 The National Wireless Safety Alliance (NWSA) is seeking qualified volunteers who are willing to take part in a beta test of the Telecommunication Tower Technician Certification exams on June 30, 2016 in Dallas, Tex. The ideal candidates to take the beta test are those individuals who are currently working as tower technicians and who have received at least some formal training in topics such as climbing safety and the installation of antennas and other tower-mounted equipment. Names and companies will not be linked to any of the test results, since the purpose of the test is to determine the validity of the questions with actual industry workers. The beta test administration will be conducted under similar conditions that typical accredited certification testing is conducted. The use of training materials, cellphones, cameras or other electronic devices are prohibited during testing. All the materials necessary for testing will be provided to the candidate. If your company would be willing to participate in allowing your technicians to take the beta testing session, provide the number of employees who will participate by contact NWSA Executive Director Chuck Slagle at nwsa@nws-a.org . The purpose of the beta testing process is to obtain data on the performance of the written exam in order to help ensure that the exams are a fair, valid and reliable assessment of tower technician knowledge. The NWSA Telecommunications Tower Technician Task Force (TTTF) members will use this data to make adjustments, if necessary, to the final written exams when they launch.